Over four months, the DMV Lab, ran by Maharat Foundation and DWAkademie has been working with 16 media professionals to teach them the skills they need to create sustainable media platforms all over the MENA region. This is because it’s getting harder and harder to finance nonbiased, independent journalism that deals with new topics from a fresh perspective. Most media outlets are politically financed these days, which makes it extra hard to stay neutral. The good news, however, is that there is a growing number of initiatives that are fighting against biased media and fake news. During the Media Management Training the participants were split into four teams.Each team worked on a media concept they could launch on the market. 1) Please introduce yourself and what you do. My name is Hassan Chaaban, and I’m the Head of Foreign Bureaus Office of Al Mayadeen channel. I’ve been working in the media industry for about 10 years now. I used to work as the financial media manager at Al Jazeera’s offices in Beirut before coming here. So you see, my main experience in this field has been rather more of media management rather than content production, and that’s something I’m very aware of. My main tasks currently include providing logistical support for the offices we have abroad so they can carry out their editorial policy and plans, especially if we need reporters abroad. 2)Are you working on anything? I’m currently working on two parallel projects. The first is a side initiative with Maharat to form the first media incubator/accelerator in the region. Media students need to understand that studying media today is not only about broadcasting and journalism. It’s also about having an entrepreneurial mindset so you can create your own platform as well. The other project I’m working on as a participant in the Media Management Training is an online radio podcast called Mosaic Radio. 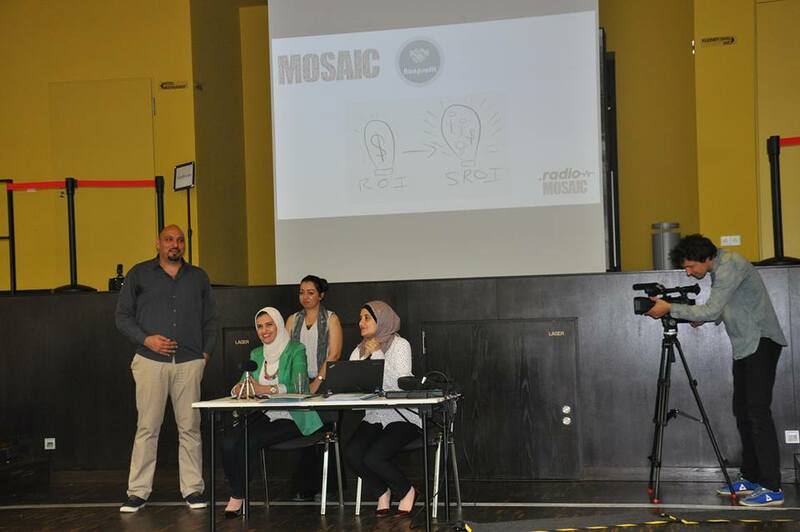 Mosaic Radio is an online podcast that deals with all kinds of minorities in the Arab World who are often abandoned and stigmatized, but in a comical kind of way that attracts listeners without insulting others. The goal is to spread tolerance and acceptance of these minorities (such as Yazidis or Shi’a in Iraq, as well as other countries). We will also be talking about the different cultures between one country and another. We are aware that these are sensitive topics which we are trying to handle them in a comedic frame. 3)What is the financial model of the program? My own program will not only be self- sustainable, but it will also be supported by the diaspora of these very same minorities we are helping. As for Mosaic radio, we’re working on diversifying its sources of income. 4) What have been the most important topics for you from the Media Management Training, and why? The last two workshops we took were about team building. And as someone who has experience in managing media teams, I found them immensely beneficial. I realized, from a managerial and HR level, that there are certain things we can do to achieve a higher productivity level, such as decreasing the regular number of full-time working hours (make them 6 instead of 8)or being more flexible with maternity leave. These strategies, which included a slight salary modification, proved to be very efficient and productive with my team. 5) Have you created any new revenue streams? Give us details. Not yet no, but I learned how to create and package media kits which are usually used to attract sponsors for certain TV programs and others. I’m hoping this will represent an extra source of revenue. 6) Finally, what’s your opinion about how quality journalism can be financed these days? I believe we are witnessing a steep decline in quality journalism, despite the fact that we receive signs of hope here and there from journalists and media institutions. The overall atmosphere is not so good, because the lack of independent sustainable sources of income. This is what is driving journalists to lose their integrity and become followers of politically biased media money. Moreover, newspapers, whether print or digital, can no longer rely on ads as a sole source of income. The only way for journalism to become self-sustainable is to diversify its sources of income. If it does not, it will still rely on political funding.